The Budapest Beacon asked several Hungarian public figures, as well as a spokesman for the Hungarian government, about their perspectives on the seven questions the Orbán government is sending to its citizens via a “national consultation” on the so-called “Soros Plan”, as well as the possible impact of the consultation. The following are thoughts from former conservative foreign minister Géza Jeszenszky, philosopher Gáspár M. Tamás, leader of opposition party Együtt Péter Juhász, and the office of government spokesman Zoltán Kovács. “’National consultation’ in Hungary is a fake plebiscite invented by the Orbán régime. Questions put to the population in the case of a proper referendum are carefully examined by the National Election Committee and by the courts, and the results are counted under legal supervision. Neither is the case here. There is no quorum, either, so the validity of the responses cannot be decided. The so-called questions addressed to the citizens – advertised with taxpayers’ money after a biased (and expensive) propaganda campaign orchestrated by the government – are based on glaringly obvious falsehoods, so they are intentionally misleading. Replies, like in the previous cases, will arrive from Orbán supporters only, therefore they will have a North Korean type unanimity of ‘votes’. 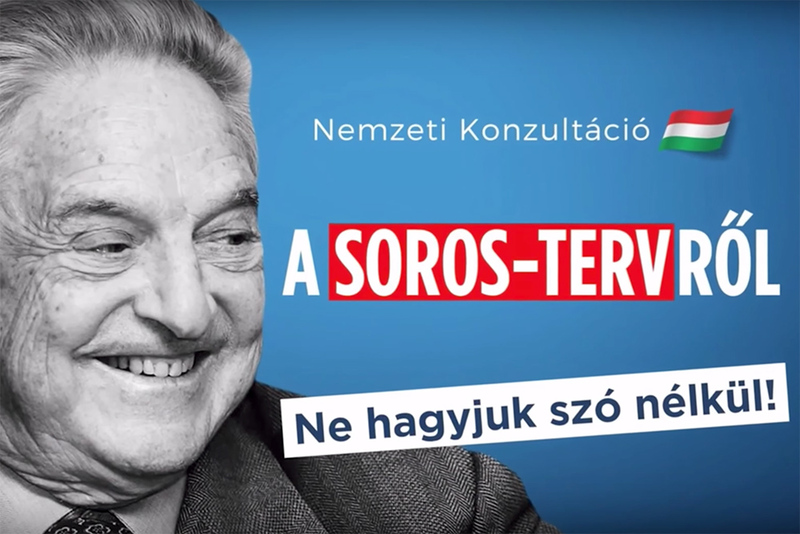 “Viktor Orbán is just starting another anti-George Soros hate campaign called a ‘national consultation’ so that he won’t have to talk about the real ‘Orbán plan’ that hurts the Hungarian people. Namely, that Hungary is being sold out, serving Putin’s Russia, and guided out of the European Union, and the prime minister is building up his own family using public funds stolen through stooges. The goal of Viktor Orbán’s so-called national consultation campaign is not to get to know voters’ thoughts, but rather to update his data. It already came to light several times that Orbán’s party illegally creates lists of Hungarian citizens based on their political affiliations, which they use in political campaigning. The lists made famous by party director Kubatov need to be updated before the elections, and that’s why the ruling party is conducting a national consultation again. During the last such campaign we found out as well that the online version [of the consultation] forwarded Hungarians’ data to a Russian server, and that’s how the campaign poses a national security risk as well. “George Soros has recently held talks with a number of EU leaders. In April 2017, he was received by Jean-Claude Juncker, First Vice-President Frans Timmermans, Vice-President Jyrki Katainen, European Commissioner for Justice Vera Jurová, and European Commissioner for Research, Science and Innovation Carlos Moedas. The programme of the European Commission on migration bears some eerie resemblance to the ‘Soros Plan’, which does not concentrate on the safety of European citizens but on the reception of a significant number of migrants and their relocation according to quotas. The reason why these questions were chosen is that these are considered to be the most important ones in order to be able to guarantee the safety of Hungarian and European citizens. In 2015, Hungary proved that mass migration can only be stopped by a three-tier – legal, physical and manpower – defence system. Should one of these elements be missing, hundreds of thousands might arrive again at the borders of Hungary, and therefore at the borders of the Schengen Area. By dismantling the border fence, we may face uncontrolled mass migration again. The network of George Soros operating in guise (sic) of a civil society, and the European Commission are jointly attacking those countries that preserve their national sovereignty and wish to exercise their right to decide who they want to live with in their country. Let us just think of the legally senseless infringement proceedings the European Commission has launched or the charges of NGOs, which themselves do not comply with the law in many cases.